We make custom etched detail for Your models of model railways. They are etched from Alpacca (new silver) or brass. These parts can be small plates like number plates, plates with railroad operator signs, manufacturer logos etc. For small parts like numberplates the price is around 0,80 EUR per plate. 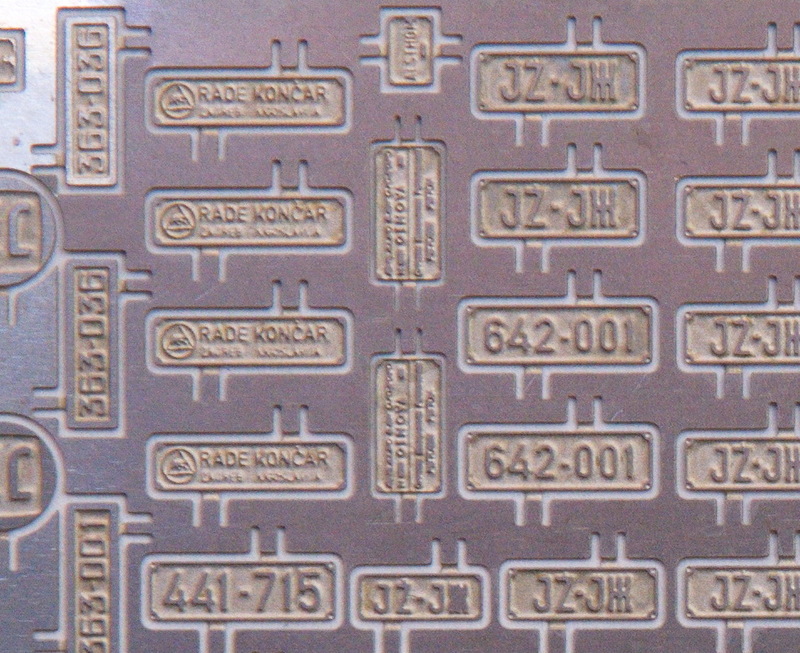 There are numerous possibilites for custom etching like profiled plates, masks for the trucks (i.e TAM, FAP, Magirus-Deutz, etc), upgrades and so on. We have also prepared etched plates for two Austro-Hungarian steam locomotives, namely KkStB 80(ÖBB 57, JŽ 28) and BBÖ 81 (ÖBB 58, JŽ 29). To create these locomotives You need some additional parts available from KleinModell Bahn / Mobenzo from Austria and other small parts from Weinert etc. Approximate price for one such kit is 140 EUR. We do not have these plates on stock, they are made on order.